"Patients get a predisposed feeling that their life is doomed. That it's going to be a complicated life, which isn't necessarily so," said Dr. Cary Twyman, a neurologist with Penn State Health. "There are many misconceptions and false information about MS on the internet, so I make sure that each of my patients properly understand what the disease is, how it occurs, and the different courses MS can take." The immune system of someone with MS has lost its sense of self. Cells that protect the body from disease can't detect what is dangerous and what isn't, so they attack the brain, optic nerve and spinal cord. Scientists still don't know what causes MS, but they believe the disease is triggered by an unidentified environmental factor in a person who is genetically predisposed to respond. "MS manifests itself in the prime of these individuals' lives," Twyman said. "These people are usually at the ages where raising a family, finding a steady job, and creating different purposes in their lives is a priority. This disorder disrupts that." A combination of methods can be used to diagnose MS. These include a careful study of the patient's medical history, a neurologic exam, and various tests, including MRI, evoked potentials and spinal fluid analysis. Some of these are included in revised guidelines released in 2017 with an aim of providing an earlier diagnosis. "Over the years, diagnosing MS has become clearer," Twyman said. "Incidents of MS have doubled since our last census. More than 800,000 people have been diagnosed in the U.S. alone, with approximately 10,000 new cases diagnosed every year, but there has been less misdiagnosis or people going undiagnosed." "We had an explosion of drugs to treat MS, where we use to have none," he said. "There are now 15 different drugs for people with MS."
Because everyone is different, there is no standard way to choose a drug to treat MS. Twyman said finding the right medication for a patient with MS depends on how far along the disease is, what the patient's tolerance to the risk of the drug is, the cost of the drug, and how closely the patient needs to be monitored on the drug. "It's no longer a physician-only approach to treat MS," he said. "It now involves a team that pays attention to an individual's medical and nonmedical needs to help with their wellness as they live with MS. This team may include nurses, dieticians, social workers and therapists, including the specialties of physical therapy, occupational therapy, speech therapy, and cognitive and behavioral management." Twyman said identifying and creating lifestyle habits, such as staying physically fit, reducing stress, and not smoking will help a patient's quality of life. 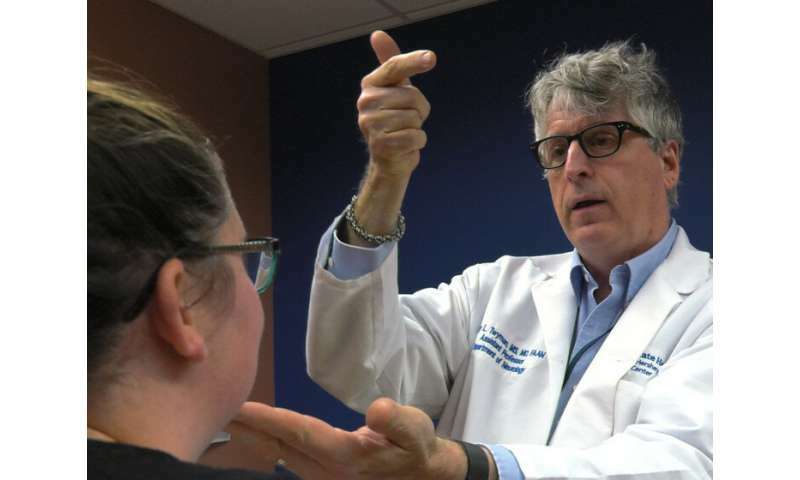 "As a comprehensive team, we are able to help our patients with MS look at their life conditions and see what improvements are needed, and then help them make those improvement together," he said.